Methyl isobutyl ketone (MIBK) is one of the excellent solvents for resins used in various surface coatings. It is also widely used in rubber chemicals for the production of tires, followed by surfactants, and insecticides. MIBK is used as a solvent in industries that produce rubber products, paints, machineries, and chemicals. Rising demand for solvents and rubber processing chemicals, chiefly owing to the flourishing growth of the global automotive industry, is expected to fuel to the overall global demand for MIBK in the next few years. However, concerns regarding the harsh impact of the material on the environment and human health are leading to an increased aversion for synthetic, petroleum-based MIBK across a vast number of industries. Analysts estimate that synthetic MIBK will gradually be replaced by bio-based MIBK across major applications in the next few years. This factor can emerge as one of the most lucrative growth opportunities for companies in the market in the near future, allowing significant traction to businesses and providing sustainable growth opportunities. Transparency Market Research estimates that the global methyl isobutyl ketone market, which valued at US$827.4 mn in 2015, will exhibit a CAGR of 7.5% between 2016 and 2024 and reach US$1,572.3 mn by 2024. MIBK is known to be one of the best solvents for resins used in the production of surface coatings. Moreover, MIBK is also used as a solvent for more than 40 applications across a number of industries. As a result, the use of MIBK as a solvent is one of the most lucrative application segments of the global MIBK market, accounting for over 54% of the overall market in 2015. The segment is expected to retain its dominant stance over the forecast period as well, exhibiting a promising 7.7% CAGR in terms of value over the period between 2016 and 2024. However, the segment is expected to lose prominence to the rubber chemicals segment in terms of rate of growth over the said period, chiefly owing to the rising demand for rubber across a number of industries and applications. The segment of rubber chemicals is expected to expand at an 8.4% CAGR in terms of value from 2016 through 2024. Owing to this, the share of the segment in the global market is expected to rise from nearly 15% in 2015 to 16.3% by 2024. In terms of geography, Asia Pacific presently leads the global MIBK market. It is followed by North America and Europe. Increasing consumption of MIBK in automotive and crop-protection industries in China, India, and ASEAN countries is expected to drive the demand for MIBK-based applications in Asia Pacific during the forecast period. China is the leading consumer of MIBK in Asia Pacific, especially in the antiozonants application. Production and demand of MIBK is expected to continue to rise in Asia Pacific during forecast period as well, granting the region a commanding position in the global market in the near future. In terms of revenue contribution to the global market, Asia Pacific accounted for a dominant share of more than 42% in 2015. North America chiefly consists of developed countries and mature markets. Therefore, the MIBK market in the region is expected to expand at a moderate pace during the forecast period. Countries in Middle East and Africa are estimated to provide lucrative opportunities for the MIBK market owing to the rise in commercial infrastructure development activities. The global MIBK market features a largely consolidated competitive landscape, with the top five companies cumulatively accounting for a lion’s share in the market’s overall valuation. Some of the key companies in the market are The Dow Chemical Company, Royal Dutch Shell Plc, Kumho P&B, Lee Chang Yung Chemical, Celanese Corporation, Eastman Chemical Company, Mitsubishi Chemical Holdings Corporation, and Mitsui Chemicals, Inc. This report analyzes and forecasts the market for Methyl Isobutyl Ketone at the global and regional level. The market has been forecast based on volume (tons) and revenue (US$ Mn) from 2016 to 2024. The study includes drivers and restraints of the global Methyl Isobutyl Ketone market. It also covers the impact of these drivers and restraints on demand for Methyl Isobutyl Ketone during the forecast period. The report also highlights opportunities in the Methyl Isobutyl Ketone market at the global and regional level. The report comprises a detailed value chain analysis, which provides a comprehensive view of the global Methyl Isobutyl Ketone market. Porter’s Five Forces model for the Methyl Isobutyl Ketone market has also been included to help understand the competitive landscape in the market. The study encompasses market attractiveness analysis, wherein end-users are benchmarked based on their market size, growth rate, and general attractiveness. 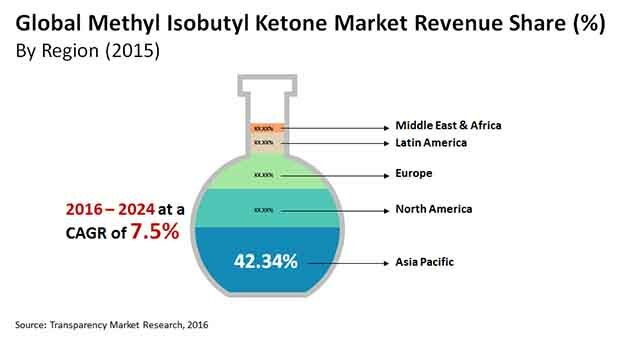 The study provides a decisive view of the global Methyl Isobutyl Ketone market by segmenting it in terms of application, and end user. These segments have been analyzed based on present and future trends. Regional segmentation includes the current and forecast demand for Methyl Isobutyl Ketone in North America, Europe, Asia Pacific, Latin America, and Middle East & Africa. The report also covers demand for individual end-user segments in all the regions. The study includes profiles of major companies operating in the global Methyl Isobutyl Ketone market. Key players operating in the methyl isobutyl ketone market include The Dow Chemical Company, Royal Dutch Shell Plc, Kumho P&B, Lee Chang Yung Chemical, Celanese Corporation, Eastman Chemical Company, Mitsubishi Chemical Holdings Corporation, Mitsui Chemicals, Inc., and Others. Market players have been profiled in terms of attributes such as company overview, financial overview, business strategies, recent developments, and SWOT analysis. The report provides the estimated market size of Methyl Isobutyl Ketone for 2015 and forecast for the next nine years. The global market size of Methyl Isobutyl Ketone has been provided in terms of volume and revenue. Market numbers have been estimated based on key application, and end-user segments of MIBK. Market size and forecast for each major application, and end-user have been provided in terms of global and regional markets. Secondary research sources that are typically referred to include, but are not limited to company websites, annual reports, financial reports, broker reports, investor presentations, and SEC filings, internal and external proprietary databases, and relevant patent and regulatory databases, national government documents, statistical databases, and market reports, news articles, press releases, and webcasts specific to companies operating in the market, ICIS, United State Environmental Protection Agency (EPA), INTERNATIONAL PROGRAMME ON CHEMICAL SAFETY, IARC Monographs, Company Annual Reports, International Conference on Harmonization.